Today’s ride was a 50 km loop from Lloseta over the Coll d’Honor and through the beautiful little village called Orient. The weather was glorious; blue skies, sunshine, but not too hot. The Coll d’Honor isn’t a massive climb, and isn’t one of the famous climbs on Mallorca, but it’s worth doing because the road is really quiet, the scenery is different to more central mountains and the road passes through various patches of woodland.We set off from Lloseta into a headwind. One group of local riders passed us, with the guy on an electric bike at the front and the others sucking his wheel. We say cheaters! The roads were tiny, gravelly and potholed, so it felt a bit like the UK, apart from the views of the Tramuntana mountains, olive groves and October sunshine. The main road into Bunyola is a straight, busy strip of tarmac that is slightly uphill and is soul destroying. We dog-legged our way into Bunyola to avoid this road and were rewarded with the smoothest tarmac ever seen. It must have been laid about two days ago. Even before leaving Bunyola the road starts to climb, with a few hairpins for good measure, before settling down. The climb is never particular steep and has sections of zigzags, open sections through fields and patches of woodland. It is just wonderful. The last few hundred metres is a section of switchbacks one after another. From the top of the Coll d’Honor there’s a technical, bumpy, twisty descent that drops 100m. Adam loved it, and Philippa got scared (I nearly overcooked the turn and then the brakes!) on the tight hairpin covered in pine needles. Then the ride passes through the Orient valley. The little village of Orient is really picturesque, and has a couple of places for drinks. The descent from Orient into Alaró was 8km of immense cycling, but it was over far far too quickly.Annoyingly Philippa got the same top speed as Adam, but was more sensible going around the bends. From Alaró we got blown back to Lloseta. 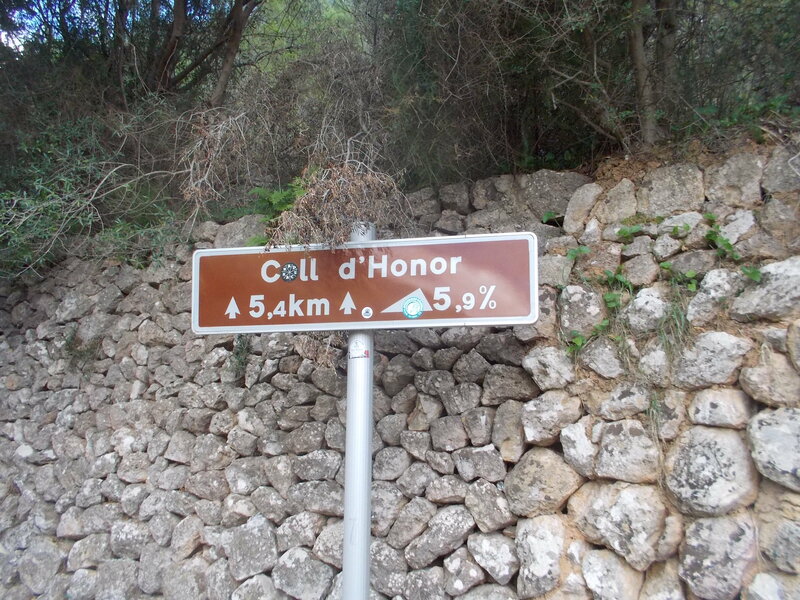 We will definitely do this ride again the next time we are in Mallorca.